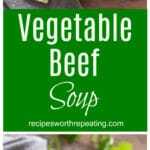 Hearty, and delicious, this Vegetable Beef Soup is comforting and a super EASY soup to make. Full of nutrition and naturally gluten free, this homemade soup is perfect for any season! 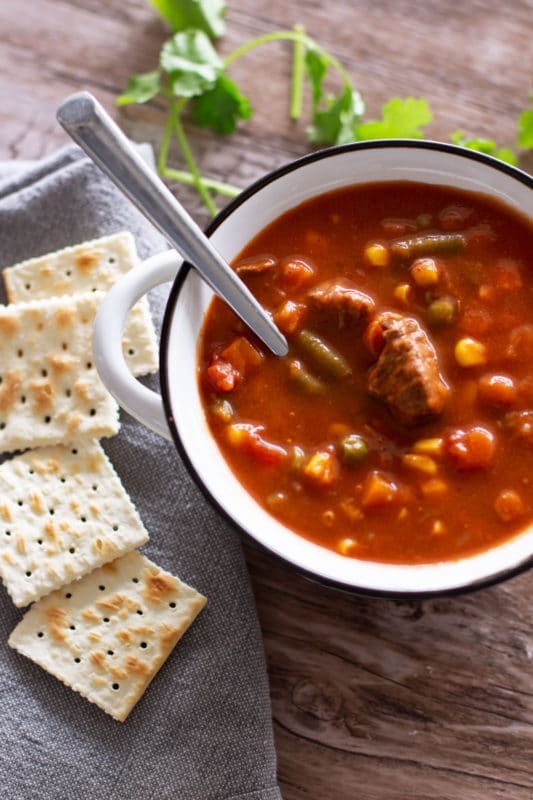 Winter, Fall, Spring or Summer…this Vegetable Beef Soup is perfect year round! 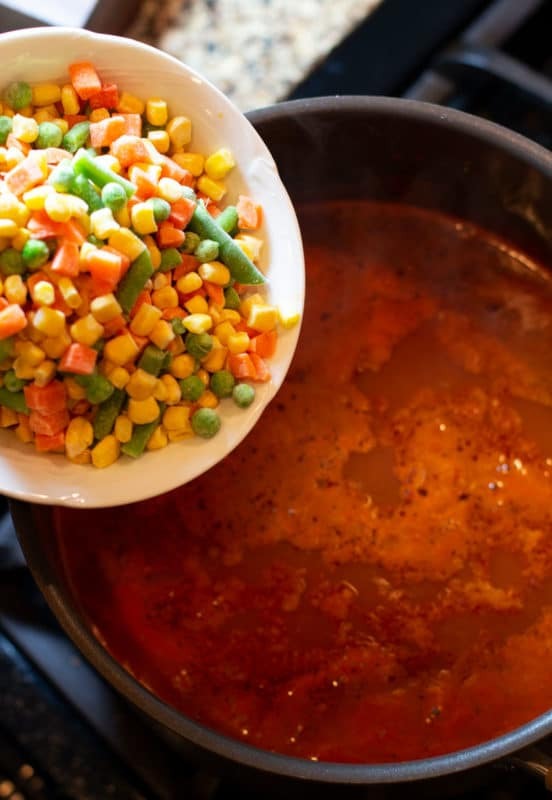 This soup is flavorful, has lots of vegetables and is so good for you! HEALTHY!! Not only is this soup delicious, it’s so super easy to make. So easy that my 11 year old pretty much makes this one by herself. Which makes me smile…this is my dad’s recipe. We’ve had this recipe in our family since I was a little girl. 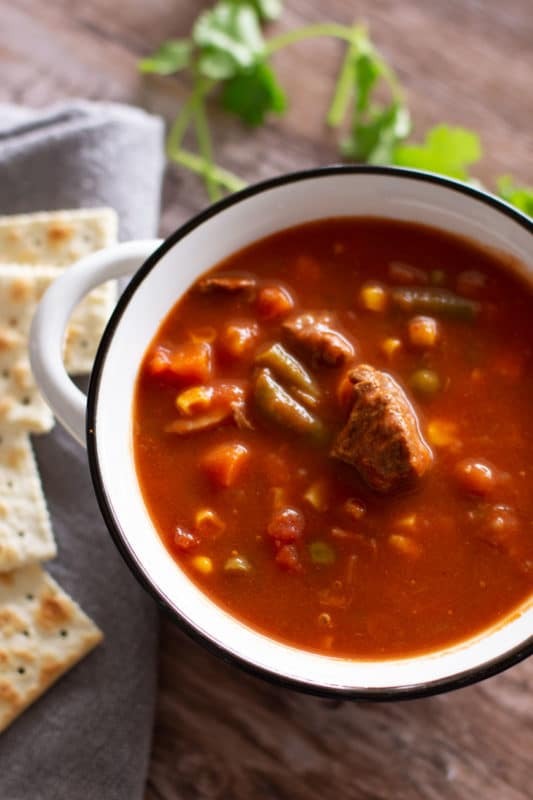 I remember coming home from elementary school smelling the aroma of warm comforting soup filling up our house on those cold days in the south. 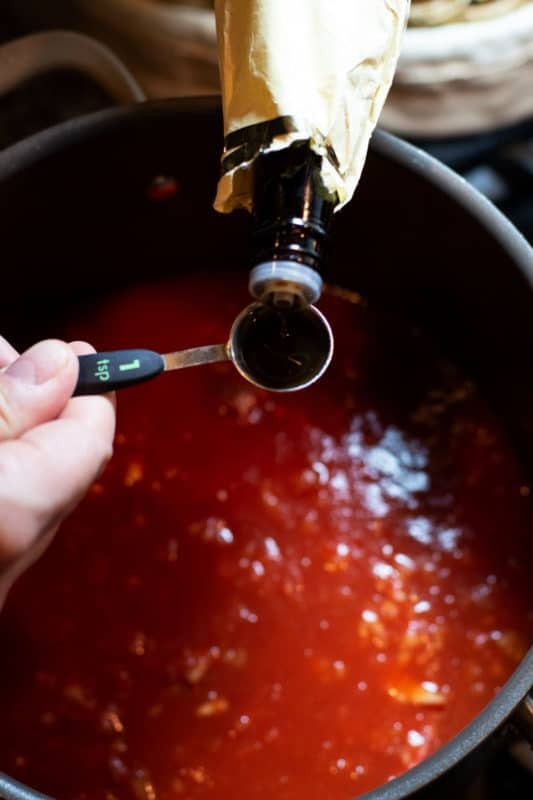 I think it will always be a smell that reminds me of my childhood and when I make this, it totally takes me back to those wonderful memories of growing up. Let’s jump into the super simple ingredients that make up this soup. I love using fresh vegetables in my soup. 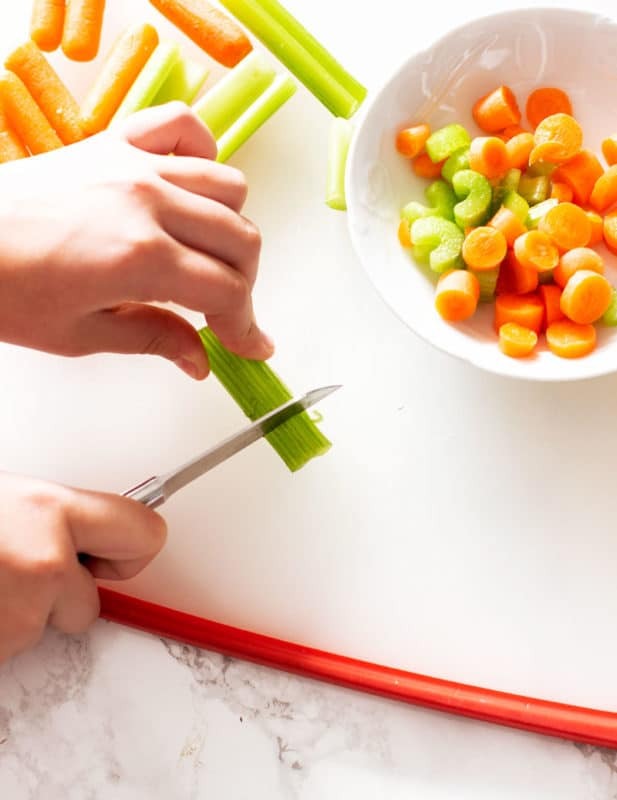 My son and I are huge carrot and celery fans so we chop those up so we can add them to our soup. Potatoes are optional. When I’m watching my carbs, I leave out the potatoes. 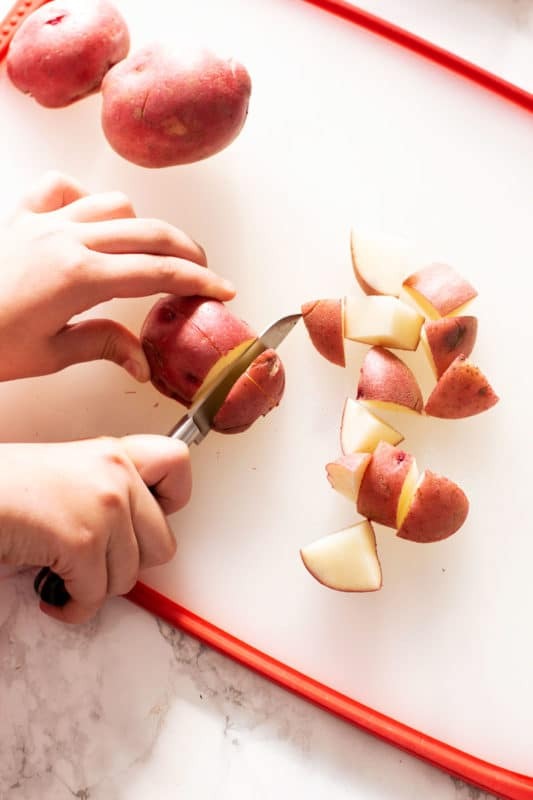 But when it’s a cold winter day and I’m craving a hearty meal, I add new potatoes. Plus, the kids love them in the soup. Leave those red skins on! That’s where all the nutrition is! From there, grab a big pot and place it on the stove top. 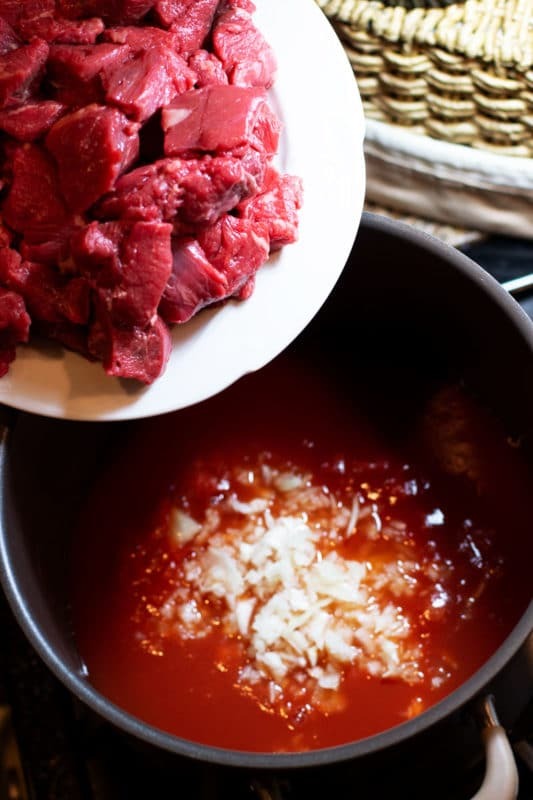 Pour in the tomato juice, beef stew meat and chopped onions. Go ahead and give it a good stir. Next, add in 1 teaspoon of Worcestershire sauce. 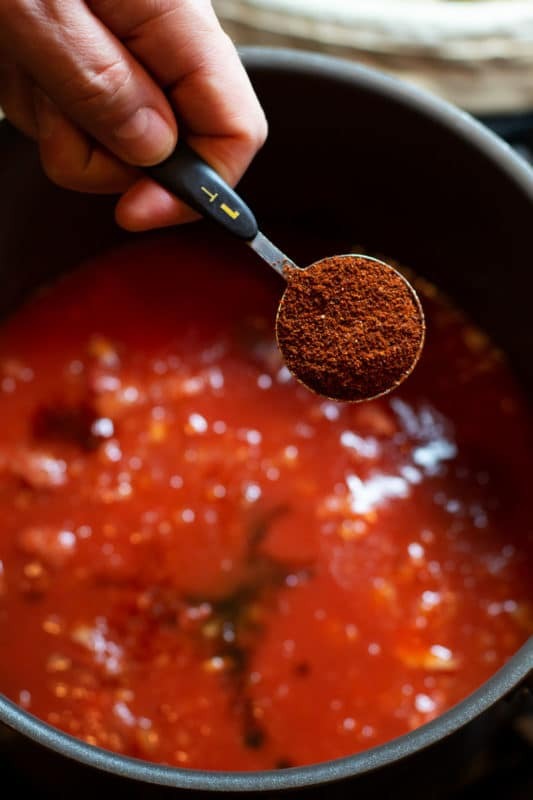 From there, add in 1 Tablespoon of chili powder. Then, add in 6 cups of water. Stir all the ingredients added in so far and cook on low for 2 hours. After 2 hours, add in the fresh cut carrots, celery and potatoes. Give all the ingredients in the soup a good stir and then add in the bag of mixed vegetables. Add another 2 cups of water to the soup, stir well and let it cook on medium low for another hour. After the 3 hours is over, you’re soup is done. Grab some crackers or a piece of fresh crusty bread and dive in! I’m warning you though…I’m guilty of eat 2-3 bowls of this soup. It’s that good! If you don’t have time to cook this soup on the stove top, no problem! You can easily make this in your crock pot! 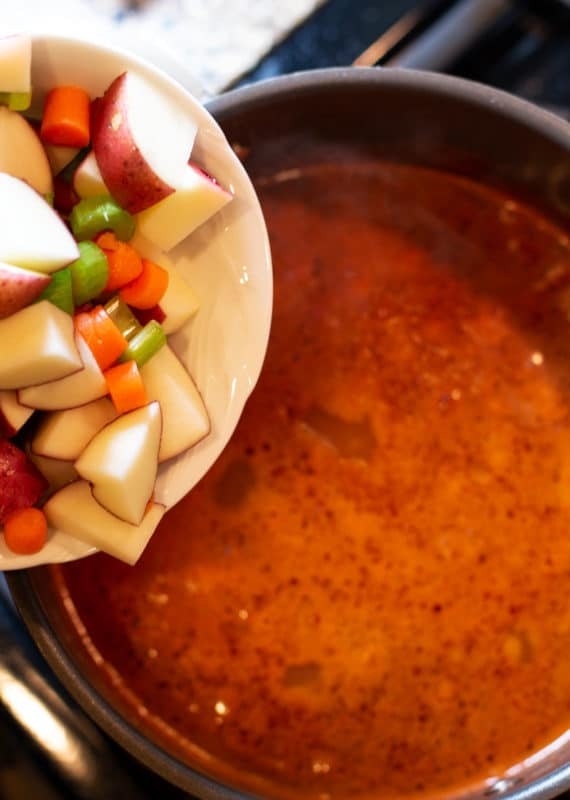 Simply add all the ingredients to the crockpot, set it on low and let it cook for 8 hours! 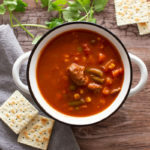 You don’t have to use beef stew meat. You can always substitute ground beef. Both methods taste delish! Ground beef is cheaper so it’s a good way to go if you are looking for an inexpensive version of this soup. 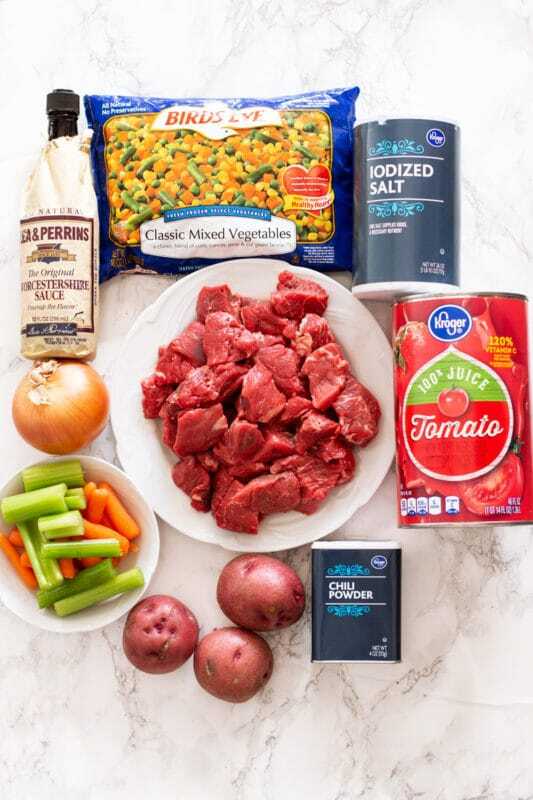 Another savings tip…if you find a chuck roast on sale, you can cut up the chuck roast into bite size pieces instead of using beef stew meat. 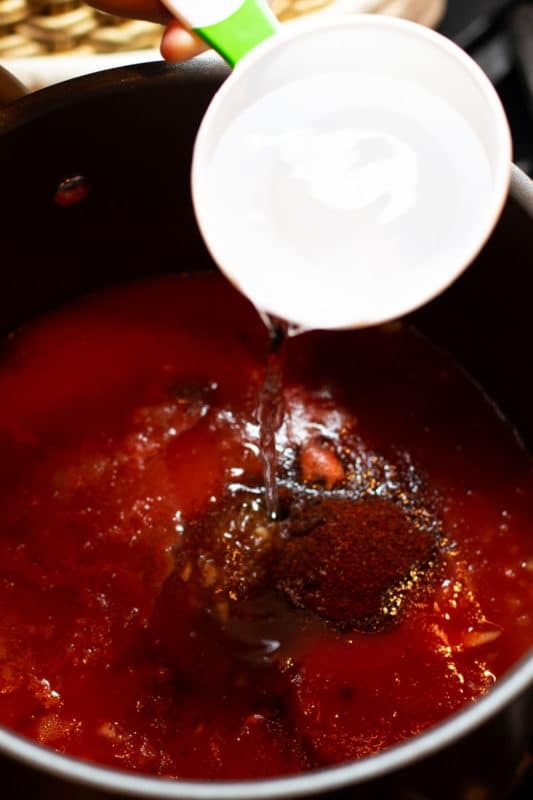 Combine the meat, tomato juice, onion and seasonings above and 6 cups of water in a large pot. Cook on medium low for 2 hours. Add another 2 cups of water to the soup. Add the all the vegetables and cook for 1 additional hour on medium low heat. Serve immediately and store leftovers in the refrigerator. This soup is freezer friendly. After the soup cooks and cools, pour into freezer Ziplock bags and lay flat in the freezer. Write the date on the bag. This will keep in the freezer for up to 6 months. Any leftovers will keep in an airtight container for 3-5 days in the refrigerator. Update Notes: This post was originally published in April 2012, but was re-published with updated step-by-step instructions, pictures and tips in December of 2018. My mother used to make vegetable soup a lot. I haven’t had it in a while, this makes me want to make it again real soon. I’m needing some soup right now and your vegetable soup looks like the perfect soup to fulfill that need. It’s cold and miserable outside. 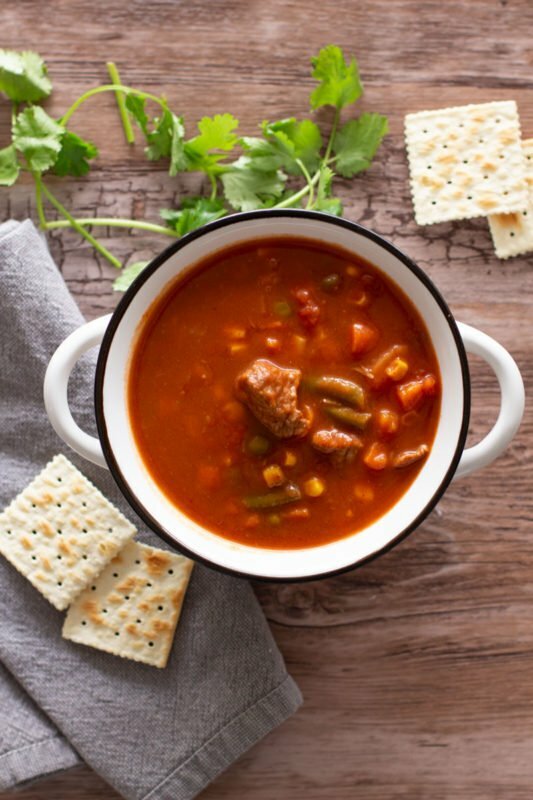 Vegetable beef soup is the perfect comfort food. The recipe is so easy – I can’t wait to make it. Vegetable beef soup brings back so many memories! I am adding this recipe to my menu for this week.